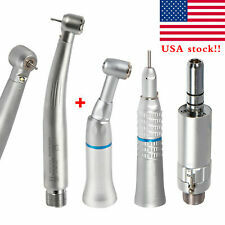 Top Quality Stainless Steel Dental Pic SE Ds106 Single Ended Pick 5-1/4"
4 pcs Handpiece included ! YBB -2HOLE E-generator Handpiece Push button, Triple water spray, LED handpiece integrate E-generator. Back siphonage prevention sanitation handpiece. Low Speed Handpiece Kit 2-Holes. Triple water spray, LED handpiece integrate E-generator. Handpiece 1. 3.4-Hole/2-Hole Push Button system. Unique electric generator, just a little air can generate sufficient power. For the LED bulb, continuous use of up to ten thousand hours,The world dental chair two holes, four holes. We have been in handpiece repair and sales for over ten years. Type Coupler. Fiber Optic No. Test our products once and realize the improved quality. Connection Type 4-Hole. Our Repair Services. We build our turbines ourselves in the USA. Dental Scaler - This tool will help you remove food or tartar deposits from in-between areas of your teeth. Very effective and efficient for scaling. Professional Dental Oral Hygiene Kit 5 Tools Free Dental Carver. Features For Dental Handpiece 2 hole standard push button handpiece. Dental high speed handpiece: 1 each. Professional LED light source, superior brightness, longevity 10000 hours. Load speed:260,000rpm for tor torque head;350.000rpm for standard head. We have been in handpiece repair and sales for over ten years. Type Turbine. Test our products once and realize the improved quality. We build our turbines ourselves in the USA. Our assembly facility is in northern Illinois. DENTAL HYGIENE PROPHY HANDPIECE 4 HOLES COMPLETE WITH 3 NOSE CONES. Warranty : 1 year. Color : Silver. Connector Type : Midwest 4 holes. Our production process has attained ISO 9001:2008, ISO 13485:2003 certification, cGMP compliant and CE certification. OUR PRODUCT RANGE. Always Best Quality! HIGHEST PRODUCT QUALITY. MAIN PRODUCTCATEGORIES. This complete kit includes low speed handpiece contra angle model, low speed handpiece straight model and low speed dental air motor. NEW Dental Slow Low Speed Handpiece Push Button 2H E-type. Contra angle handpiece. We have been in handpiece repair and sales for over ten years. Type Turbine. Test our products once and realize the improved quality. Our Repair Services. We build our turbines ourselves in the USA. Press the pedal, handpiece operation and examine whether the normal operation of the spray head. If everything is normal, you can start using the handpiece. 1 x High Speed Handpiece. Dental handpieces right use way. 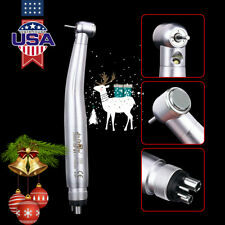 Dental Fiber Optic Handpiece E-generator Internal 3 spray 2 holes YBB. Push button, Triple water spray, LED handpiece integrate E-generator. Back siphonage prevention sanitation handpiece. Unique electric generator, just a little air can generate sufficient power. This is a dental Fiber Optic High Speed turbine handpiece which is Fit the KAVO Multiflex Lux Coupler. Both handpiece and quick coupling are autoclavable. LED High handpiece with 6 hole coupler. Handpiece length : 113.7mm. Connection Type Midwest. Test our products once and realize the improved quality. We build our turbines ourselves in the USA. Our assembly facility is in northern Illinois. We are very reasonable people and want to be fair. Tempered and hardened for a longer life. What you see is what you get! Actual Product Image. · We Try Our Best To Describe The Products As Accurate As Possible. AN EXCELLENT ITEM. Excellent Quality - Worth Buying! NEW GERMAN STAINLESS Dental Mirror with Handle Dental Filling tool Separator - Dental Scraper, Dental Mirror, Dental Probe & Dental Scaler ( 6 PC KIT ). Lubricate: No. Smooth finish for aesthetic and corrosion resistance. It is intended exclusively for use by trained dentiet only in clinic or laboratory. Obturation Pen-----1 PC. Pen Tip -----2PCS. Charging system. Heat: Press the button to heat the tip, the Led indicator light red.The tip can reach working temperature within 3 second. NSK style Pana Max high speed handpiece. - 2-hole/4 hole standard push button handpiece. - Idling speed of handpiece should be no less than 370,000 rotations under working air pressure of 25-30 pressure atmosphere. E-generator LED High speed handpiece. -Type:Dental High Speed Handpiece. -Chuck style:push button style dental handpiece. -Material:Stainless steel alloy for led handpiece integrate e-generator. -LED light:led handpiece integrate e-generator. Compatible with all e-type motors(NSK, Aseptico,W&H,Nouvag Acteon)Implant Handpieces ISO E-Type. Provides sufficient force at low speed. 100% satisfication! Button type chuck. The sale of this item may be subject to regulation by the U.S. Food and Drug Administration and state and local regulatory agencies. 7" Micro Surgery Scissors. 7" Needle Holder. Dwyer Photophilic Pressure Switch / Gauge Series 3000 NIB. ~6 PC GERMAN DENTAL ORAL DOUBLE SIDED MIRROR #5 ~. In addition Surgical Pros Incorporation is accredited toCE, ISO 9001, ISO 13485, and FDA. •Mirror Finish : No. QUANTITY:6 PC. SET INCLUDES ONE EACH OF THE FOLLOWING. Provides sufficient force at low speed. Max torque 50Ncm. We're one of the largest online dental suppliers based on many qualified manufacturers in china. Looking forward to our friendly & win-win cooperation. Lubricate: No. In addition Surgical Pros Incorporation is accredited toCE, ISO 9001, ISO 13485, and FDA. 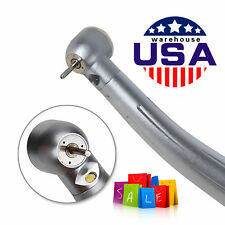 Manufactured from AISI 420 Premium Quality stainless steel. Surgical Grade Stainless Steel: Yes. Feature: the size of the head is 1cm. hard chrome body imported ceramic bearing hygiene head system triple spray water and spray come out from the same place push button chuck standard head speed: 380000-450000 rpm midwest 4 hole or 2 hole The tubine has a built in generator that powers the LED light bulb. You don't need any special fiber optic source. SKU: XM-A-T3-LED-B2. 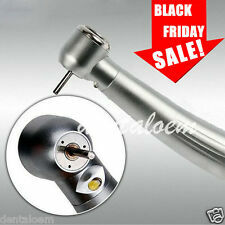 New 2 Pc STAINLESS STEEL DENTAL PICK INSPECTION MIRROR 7"